Here is a simple screen free activity for the afternoon inspired by Asia Citro’s book 150 Screen-Free Activities for Kids. 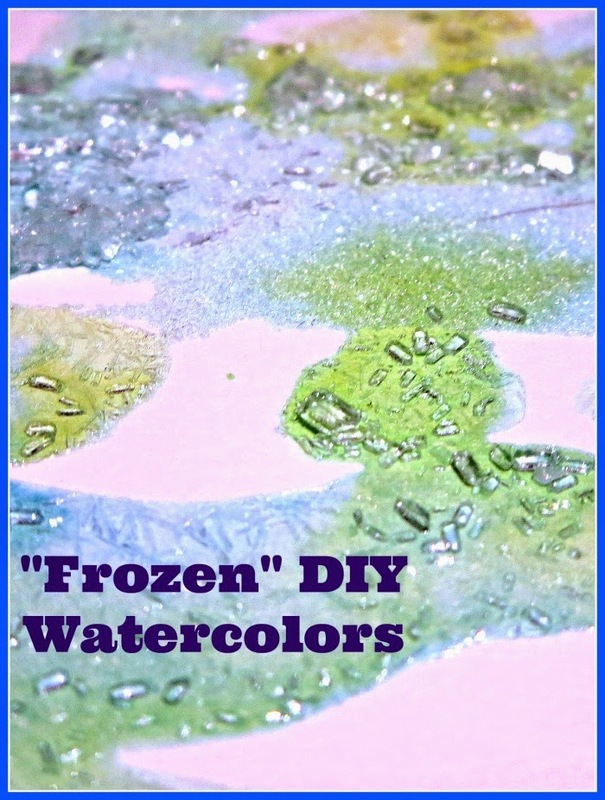 It truly took us only 5 minutes to start creating with these crystallizing watercolors, and the results were amazing. Disclosure: I am an Amazon associate and this post contains affiliate links. For full disclosure, please click here and thank you for supporting my blog! I was delighted when Asia Citro from Fun at Home With Kids asked me to join a blog tour for her new book 150+ Screen Free Activities for Kids. Asia is a master in creative sensory play, and her ideas are extremely popular in my kid blogger feed. Asia kindly sent me her book for review, but initially I was a little skeptical on whether her screen free ideas would engage my 8 year old who is normally a lot more interested in reading than in any sort of craft activities. I couldn’t be more wrong. My daughter went very carefully through the book marking the pages with multi-color bookmarks and exclaiming, I really want to do this! many times. I was amused to see that she was particularly attracted to some of the messiest activities in the book – perhaps exactly because she didn’t get to do a lot of those when she was younger. In fact, she had commented to me, Some activities in this book say that they are for babies and toddlers, but I still like those things. I still like textures, and I am still drawn to locks (this is a reference to specific activity in a DIY toys section of the book that she is lobbying her father to help her make). I love her enthusiasm, and I also love that, as an older child, she can do many of the activities in this book on her own outside when the weather is warmer. In the meantime, I suggested an activity that appealed to me, because it required very little prep time – Crystallizing Watercolors. The recipe for these watercolors is very simple. One less common ingredient for them is Epson Salt, but we happened to have it already from making Sparkling Bath Stones. I don’t want to divulge the exact recipe, but normal salt and Epson salt are mixed with a bit of water. The color can be added with either liquid watercolors (I think the color would have been more intense) or food coloring. We chose to go with food coloring. Smarty chose to use only primary colors for her paintings. First she tried to paint a Christmas tree, but colors made with food coloring are usually very light, so she quickly switched to more “process-oriented” art of blending colors with the goal of making backgrounds for future Christmas cards. One troubleshooting tip – our watercolors contained some salt crystals that didn’t fully dissolve in water. This added some interesting 3D effect to the paintings, but the real fun starts when the smooth color dries out. It then crystallizes in a beautiful frost-like pattern and the big crystals sort of take away some of the effect. Next time we will try to make sure all crystals are fully dissolved. And I am sure that there will be the next time, since Smarty wants to make more cards using these watercolors. In fact, she wants to give her best friends cards with the painting on the front, and the recipe for these watercolors in the back. Do I Recommend 150+ Screen Free Activities to Older Kids? Absolutely. Watching my daughter reading it and discussing it with me made me realize that older kids are not “beyond” process and sensory art – in fact, they can enjoy it on an entirely different level with more independent experimentation than younger kids. If even my non-arty child was so delighted by this book, many other children will probably feel the same. Follow Natalie Planet Smarty Pants's board Concoctions for Play on Pinterest. Did you try homemade watercolors? I love this book - so many great ideas for kids, and very nicely done! I think my kids would also enjoy this particular activity. How to Teach Geography to Young Kids?